Foreclosure volume continues to slip. According to foreclosure-tracking firm RealtyTrac, in September, the number of foreclosure filings nationwide fell 7 percent from the month prior, and fell 16 percent from September 2011. RealtyTrac defines a “foreclosure filing” as any of the following foreclosure-related events : (1) A default notice on a home; (2) A scheduled auction for a home; or, (3) A bank repossession of a home. September’s 180,427 foreclosure filings mark the lowest monthly total in more than 5 years. It’s a signal that the U.S. housing market is in recovery, while also reflecting the success with which banks and homeowners have found alternatives to the foreclosure process, including the short sale. Based on data from the National Association of REALTORS®, short sales now account for 45 percent of “distressed” home sales nationwide/ As recently as April, the percentage of short sales was just 39 percent. 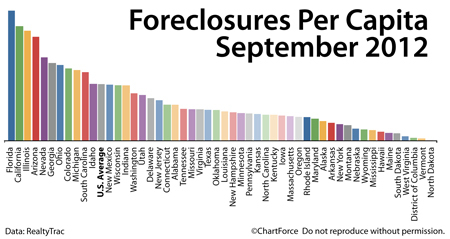 In addition, in September, Florida posted the top foreclosure rate nationwide for the first time since April 2005. Foreclosure starts moved higher in the Sunshine State for the 11th straight month and bank repossessions are now up 23 percent as compared to September 2011. 1 in every 318 Florida homes received some form of foreclosure filing last month. The national average was 1 in 730. Whether you’re a first-time home buyer or an experienced one, homes in various stages of foreclosure have allure. They tend to be sold cheaply as compared to non-distressed properties, for example. However, buyers should look beyond just the “list price”. Foreclosed homes are often sold as-is which means that homes may be defective and uninhabitable. This would render the home un-lendable, too, for buyers using bank financing. If you plan to buy a foreclosed property in Scottsdale , therefore, be sure to engage an experienced real estate professional. The internet can teach about “how to buy a home”, but when it comes to writing contracts and inspecting homes for defects, you’ll want to have an experienced agent on your side.